Here we are. At. December. You didn’t miss November. I might have. Ok, I definitely did. In October I mentioned I tend to “fall off” in fall. And it happened. November came and went without a recap of October or a new list. I did say this in October…”I’m a solar powered human so less light typically means less energy and enthusiasm for me”. It happened. I lost a bit of spark. I fell into some funkiness, including binging TV shows, hiding under covers, hanging out close to warm places indoors, letting the darkness settle in. Maybe more than I wanted. And also, it wasn’t all bad. I had good company. Amazing, really. The good news here is I have been on this planet long enough to know it was coming, so I planned a trip to Mexico for the shortest two weeks of the year, and since I fly south tomorrow, I’m feeling inspired to set up my December #microbucketlist. It’s a good move for me and one of the smarter planning things I’ve done. (p.s. wanna know what the heck a micro bucket list is? Check out this post). My friend Rachel Kurtz created an amazing signature tune for me to use while wearing all my different leggings in October. It was the best!!! Really the best. And everyone loved it. It’s coming back in a new form and fashion soon. I’ll share this when it does, promise! For now here’s a little bit of what I wore for the month with the best legging song ever. I wore each of these leggings during October! I learned how to say, “I’d like coffee”. “Can I get a ride?”. “What is your freshest fish?”. “I’d like a beer”. So hopefully I’ll always be able to find a bathroom when I head to Mexico tomorrow, which is a very important thing. Truly. SURPRISE! SURPRISE! (Maybe?) You’ll need to stay tuned on Instagram to find out when this one happens. 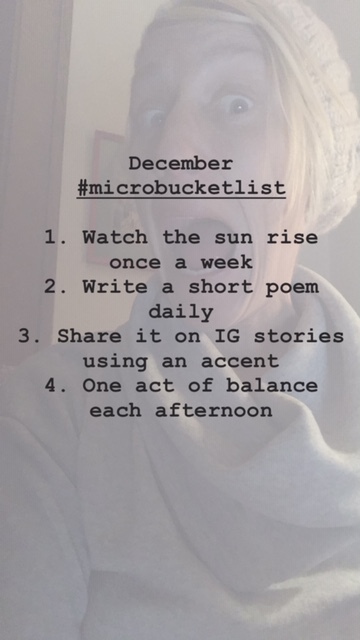 Okay lovely, Let’s meet on the socials and be sure to share with me if you’re doing your own #microbucketlist adventure too.